Suited forÂ jobs where high visibility is not needed, Eclipse™ Tri-HazardÂ® Suit offers liquid-proof, arc flash, and flash fire protection. Flame-resistant PVC coating on NomexÂ® provides 100% liquid proof protection in comfortable and lightweight suit, while Thermo-GridÂ® technology helps block out heat energy.Â Made to resist industrial acids, chemicals, and caustics, garments conform to ASTM F1891 and NFPA 70E – CAT 2 for arc thermal performance and ASTM F2733 for flash fire performance. Piscataway, New Jersey, – Introducing Tingley Rubber Corporation’s newest addition to the revolutionary Eclipse product line. 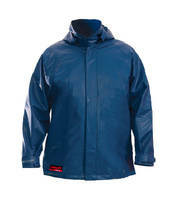 The new styles incorporate features for petrochemical applications and other jobs where high visibility is not needed. Tri-Hazard® protection offers liquid-proof, arc flash and flash fire defense, while patent-pending Thermo-Grid® technology helps block out heat energy. The flame resistant PVC coating on Nomex® provides 100% liquid proof protection in a comfortable and lightweight suit. These garments conform to ASTM F1891 and NFPA 70E – CAT 2 for arc thermal performance and ASTM F2733 for flash fire performance. The Eclipse is engineered for protection – made to resist industrial acids, chemicals, and caustics. It is ideal for petrochemical and chemical applications as well as off-shore drilling. The Eclipse will be available in March 2016 and kicks off Tingley’s newest sub-brand, Tingley FR™, a line of flame resistant non-high visibility products designed to complement its successful Job Sight FR™ line of high visibility FR apparel.